In my years as an investor and finance journalist, I’ve seen plenty of big trends pop up that sweep an industry. “Swamp an industry” might be a better phrase, actually. Because what’s left in the end is a lot of thoroughly weakened companies — and many disappointed investors. I saw it happen in the early 2000s when nine of the nation’s 10 largest (and publicly held) movie theater chains went bankrupt. Audiences wanted new venues with stadium seating (a novelty at the time), leaving the chains to pay leases on hundreds of oversized but unprofitable locations. More recently it happened with indoor shopping malls. Hundreds were thrown into foreclosure. E-commerce killed off their run-of-the-mill retail chain clients, leaving mall owners with too few store leases and unsustainable debt payments. The same is about to happen to the global auto industry. It will leave a few winners and many losers. And electric vehicles will be the culprit. That’s the conclusion from Detroit-based consulting firm AlixPartners’ 2018 report. According to its data, Detroit and the rest of the global auto builders are spending upward of $255 billion to introduce more than 200 different models of electric vehicles (EVs) within the next few years. In many ways, a glance at a sales chart for U.S. EV sales last year tells you all you need to know about the industry’s coming crisis. Basically, there’s Tesla … and everyone else. That says a lot about the power of Tesla’s brand, CEO Elon Musk’s cult of personality and the quality of Tesla’s vehicles. But it doesn’t say much about the attractiveness of electric vehicles to consumers overall. Otherwise the chart wouldn’t look so lopsided. 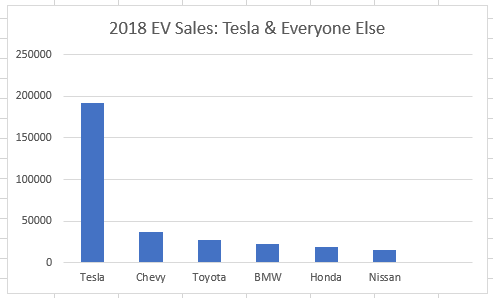 EV Sales Not What They Seem? Nor do China’s EV sales appear spectacular, when you dig beneath the surface. Never mind the massive Chinese subsidies for battery-powered vehicles (which are starting to be phased out). Just in December, Chinese consumers supposedly purchased nearly 160,000 vehicles, a 62% jump over year-ago levels. I say “supposedly” because other reports indicate that in the last few years, roughly one-fifth of Chinese EV sales volume is going to “fleet sales” for Uber-type ride-hailing firms, car rental agencies, government fleets and the like. To me, that raises a bunch of red flags. In the years before the 2008 financial bust, U.S. automakers were doing much the same thing — selling huge volumes of marked-down new vehicles to fleet buyers — to make their sales look healthy. As AlixPartners’ report points out, global automakers’ $250 billion bet on EVs is happening as they spend $61 billion (and counting) to research, develop and manufacture fleets of autonomous vehicles. No one really even knows when the tech will be ready for prime time. But auto companies are forced to spend the money anyway. Otherwise they risk being left behind. You can see where all this is headed, right? It has the makings of a terrible game show called: The Price Isn’t Right. So what’s my bigger point? We’re talking about the “dark side” of disruption here. We love celebrating the investment opportunities that come with rapid change. But the downside means we’ll see lots of losers and only a few winners. And even betting on those — Tesla comes to mind here — is a tough sell. Let’s not forget that we’re entering an era of rising interest rates and less liquidity by global central banks. Tesla is a highly leveraged company, serving a mostly high-end base of customers. That leaves little room for the unexpected, like recessions, credit crises and other financial train wrecks still to come.